The oil company behind the spill in California has been in trouble before. Plains All American Pipeline was ordered to pay more than $40 million by the Environmental Protection Agency and the Justice department back in 2010. The settlement, including a $3.2 million penalty, resolved violations of the Clean Water Act stemming from 10 oil spills in four U.S. states from 2004 to 2007. That's just one example of what appears to be a checkered safety record at Plains (PAA), a publicly-traded partnership that operates energy infrastructure. 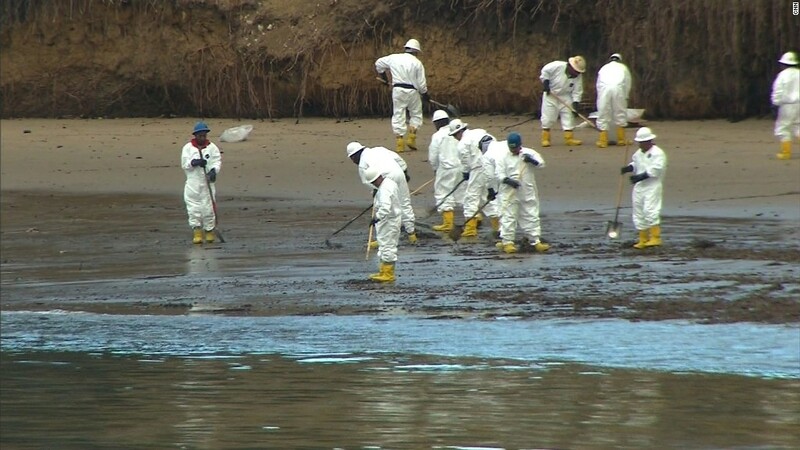 According to the US Pipeline and Hazardous Materials Administration the company has racked up 175 federal safety and maintenance violations since 2006, with more than 16,000 barrels in spills that have caused more than $23 million worth of property damage. 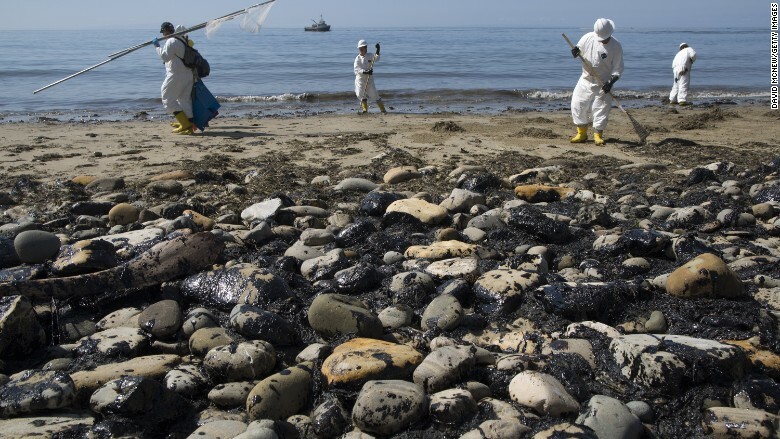 Plains is expected to announce new details later Thursday on what caused a 24-inch pipe to rupture and spill more than 100,000 gallons of crude in Southern California, which includes Refugio State Beach, a protected state park about 130 miles northwest of Los Angeles. The pipeline has spilled 100,000 gallons of crude in Southern California, which includes Refugio State Beach, a protected state park. The spill was identified just as the summer tourist season gets underway with the Memorial Day weekend. California Governor Jerry Brown declared a state of emergency on Thursday, to help free up resources needed to clean up the mess. "We will do everything necessary to protect California's coastline," said Brown. The pipeline is located underground, so it will take a few days to determine how much crude oil was actually spilled, according to Rick McMichael, Plains' director of pipeline operations. McMichael told reporters an estimated 21,000 gallons of crude had gone into the Pacific Ocean. The rest was spilled on land. Plains CEO Greg Armstrong said he was deeply sorry for the spill. "We apologize for the damage that has been done to the wildlife and to the environment, and we're very sorry for the disruption and inconvenience that it has caused the citizens and visitors of this area," he said. The company has yet to determine what caused the pipeline to break. In the 2010 settlement, the EPA said most of the spills Plains was cited for were caused by corrosion in the pipelines. Those spills, which ranged from 105 gallons to 189,000 gallons, were in Texas, Louisiana, Oklahoma and Kansas. -- CNN's Paul Vercammen and Ed Payne contributed to this report.